Steward Health Care, a physician-led organization is seeking a CRNP-SNF/Geriatrics to join our rapidly expanding system in Easton, Pennsylvania. Excellent opportunity with competitive salary and full benefits package offered. Steward Health Care is a fully integrated community care organization and community hospital network operating 38 hospitals in the US, across 10 states and the country of Malta. Our practice is uniquely located within an hour of New York City, Philadelphia and the Pocono Mountains. The area is home to numerous top notch private, charter and public A-rated schools. Come and enjoy our sites, our attractions and most of all our residents. Steward Health Care, the largest private hospital operator in the United States, is a physician-led health care services organization committed to providing the highest quality of care in the communities where patients live. Headquartered in Boston, Massachusetts, Steward operates 38 community hospitals nationwide that employ approximately 37,000 people and regularly receive top awards for quality and safety. The Steward network includes more than 26 urgent care centers, 42 preferred skilled nursing facilities, substantial behavioral health services, over 7,300 beds under management, and more than 1.1 million covered lives through the company’s managed care and health insurance services. 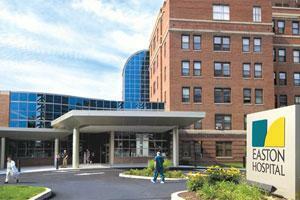 Easton Hospital is a 238 bed facility and 43 medical specialties. It employs almost 900 health care professionals, including 294 active medical staff. It has 24 practice offices across the Lehigh Valley, four diagnostic centers and one community care clinic. Easton Hospital maintains its commitment to growth by creating new programs and reinvesting in its services. In 2012 Easton Hospital opened its Health and Wellness Center in Forks Township which is a convenient one-stop medical location that includes physician practices, a walk-in clinic, lab and imaging services, mammography, spine center, physical therapy and occupational medicine. In this anniversary year, the hospital plans a renovated intensive care unit, a new behavioral health unit, new diagnostic centers and expanded oncology services. Today’s work creates a legacy for tomorrow’s generations. To that end, if you look out the windows at Easton Hospital, you see something different: A neighborhood. It’s one of the differences Easton Hospital prides itself on. Easton Hospital is proud to live in the Lehigh Valley neighborhood, work with your neighbors and deliver care to neighbors across the Lehigh Valley for the past 125 years. We look forward to another century of caring for the community.